The greatest event for the figure skaters - figure skating summer ice camp in the city of Kranevo, Bulgaria, at Black Sea Ice Arena, from 12 till 24 August 2019. Camp of figure skaters and rest for all family it is a great opportunity to save your time and to combine intensive figure skating training sessions with rest by the sea. Registration to the camp already is open - join us! A unique complex on the Black sea coast, 50 m from the ice rink «Black Sea Ice Arena». A great place for the figure skating camp and rest for whole family. Free Wi-Fi, sunbed, umbrella and towels on the beach. There are SPA Center, mineral water pools, playground for kids, water slides and more. A unique complex on the Black Sea coast, 50 m from the ice rink «Black Sea Ice Arena». A great option for big family with friends. Free Wi-Fi, sunbed, umbrella and towels on the beach. There are SPA Center, mineral water pools, playground for kids, water slides and more. 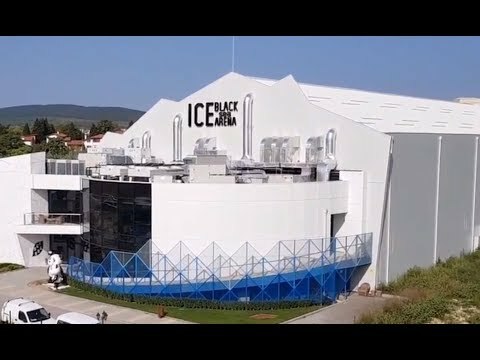 «BLACK SEA ICE ARENA» is a modern training complex. The ice arena on the seacoast - to be on the golden beach and to swim on the black sea in few moments after an ice training session - it's the reality. Restaurant «Therma Beach» located on the beach at the Black Seacoast. Exquisite food and good menu. The greatest event in the youth sports is figure skating summer camp in Kranevo (Bulgaria). It is known that there are only three ice skating arenas, located on the seacoast: figure skating summer camps are held in Sochi, Dubai and in the Bulgarian «Black Sea Ice Arena», where we invite you to attend our figure skating ice camp, this summer from 12 to 24 august 2019. It is in this palace of sports, who are located on the Black Sea coast, would be held ice camp for figure skaters of any level and age. Nearby are a natural reserve «Baltata» and the unique five-star Therma Village hotel with thermal, mineral and sea water pools. This is where are placed participants of figure skating ice camp. The ice rink, the hotel, the beach and the sea are located in close proximity to each other, therefore, the figure skating here can be harmoniously combined with a holiday for parents, who have come to the camp with their children. Figure Skating Summer Camp will be successful, if the skaters will learn how to do Axels, as well as learn jumps on harness system and will practice most of elements of figure skating on the ice. In addition, the children often see a camp (figure skating) not only as school, but also as an arena for the competition with another skaters from the different counties. We believe that figure skating summer camp in Bulgaria will bring you personal victory and advantage over rivals. I want to express my deep gratitude to Alexander and his team !!! We arrived for 3 weeks and are very pleased with the success, you taught my daughter a lot! We plan to come again next year! I want to thank the International Figure Skating camps team for their professionalism and excellent work with children. My daughter got in shape after the injury and gained new skills. This is our first experience with a trip to the figure skating ice camp, and we were satisfied! My daughter wants to come back again as soon as possible and we will be happy to support her! Thank you very much! Thank you very much for all the training sessions, as well as for assistance in booking hotel and other organizational questions. It's great that a lot of time is spent not only for jumps, but also for pirouettes. In your camp, Anton started to learn new positions for the first time and improved basic ones. He liked Alexander's method of learning jumps - especially the jumps of new entrances. Thanks to that, I believe that Anton has made great progress in this camp. The choreographer was also very professional in his case, and even within 2 weeks, the result was visible. We are very pleased with the job you have done. I would like to find another opportunity to participate in your camp again. Thank you very much! The skating camp was awesome. The coaches were amazing and helped improve and learn elements such as jumps and spins. All the coaches were great and fun. For example, Elzbeta was strict but in a nice way. If you were working hard and completing the tasks correctly and nicely she would see it and would really appreciate it and congratulate you. The other coach was very friendly and knew how to talk to children and help them so next time they would do it better. And last but no least, Alexander, he was also very helpful and respectful. He worked hard to teach everyone how to do elements and how to make them better. Without him there wouldn't be this camp and great opportunity to skate and make great friends that would help you reach your goals and help you throughout the weeks. Thank you for everything and we will be coming back.